All workers who are involved in trenching and excavation work is put at risk of potential hazards. Cave-ins present the greatest risk and are most likely to result in worker fatalities. Employers must ensure that entry into a trench is only allowed after proper protections are in place to prevent cave-in hazards. Other potential hazards include falling loads, hazardous atmospheres and hazards from mobile equipment. Designated by the employer, a competent person is someone who is capable of identifying hazards in and around the work area. This person is authorized to take immediate action to correct any and all hazards in order to protect workers on the job site. Do not enter trenches that don’t have the proper safety systems in place. A competent person must be on the job site throughout the duration of the work. Evaluate trenches after storms, excess rain, earthquakes or tremors. Test for possible hazardous atmospheres when trenches are deeper than 4 ft.
Do not jump into trenches and use safe access methods instead. Provide fall protection for workers. 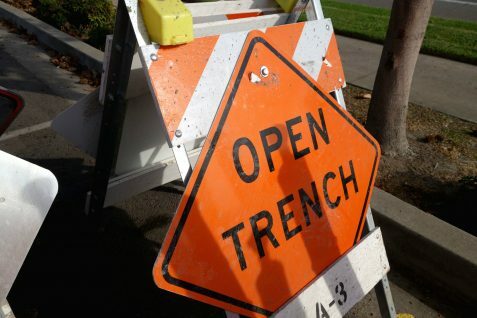 Trenches must be protected from motorists or machines that could drive into the work site. Trenches deeper than 20 ft. must be designed and evaluated by a registered engineer. Workers should not work beneath elevated or lifted loads. Trench protective devices must extend 18 inches above the top of the trench. Supplies and tools should not be placed within two feet of the trench to prevent them from falling in and potentially causing injury to workers. Never lift or lower workers with digging equipment.